I haven’t met a teacher who would say “I don’t want my students to have a productive conversation in my classroom.” Yet, planning, structuring, and instantiating productive student conversations in not an easy task. Diego’s research focuses on improving pedagogy for conservation biology at elementary and secondary education levels, especially as it relates to the use and interpretation of language around scientific concepts. These are some of the questions that our team had in mind when we put together the MOOC, “Constructive Classroom Conversations: Mastering Language for the Common Core State Standards.” Specifically, our goal is to increase teachers’ repertoire of classroom activities to promote academically-engaged classroom discourse. To do this, we have designed a series of assignments that will allow educators to learn and practice strategies for analyzing and building students’ abilities to engage in constructive dialogues. Additionally, our goal is to develop an online learning community in which educators can share tips, ask each other questions, and support each other in building rich academic discourse in all disciplines and across grade levels. We hope you join us for this course! Registration is open now through the end of the week and is available here. Editor’s Note: This is our second “Prof Post,” featuring blog entries from the instructors bringing you NovoEd courses. This post is written by Diego Román, who is a John Evans Gessford Stanford Interdisciplinary Graduate Fellow in K-12 Education. 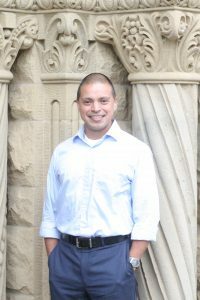 Diego helped develop “Constructive Classroom Conversations” with Kenji Hakuta, a Stanford Professor, along with a team of other talented individuals from the School of Education.